Discussion in 'News & Features' started by TheRapture, Jan 13, 2017. Among them was Splatoon 2, the latest entry in Nintendo's paint-splattering shooter franchise! Splatoon 2 will hit shelves for the Nintendo Switch this Summer with new weapons, maps, features, and much more. Traditional 4-on-4 turf battles return in this full sequel to the original breakout hit game, along with new stages, new fashions and new weapons such as the two-handed Splat Dualies. Players can compete on the TV or on the go. Whether they use the Nintendo Switch Pro Controller (sold separately) or Joy-Con, players can aim their ink using gyro controls. 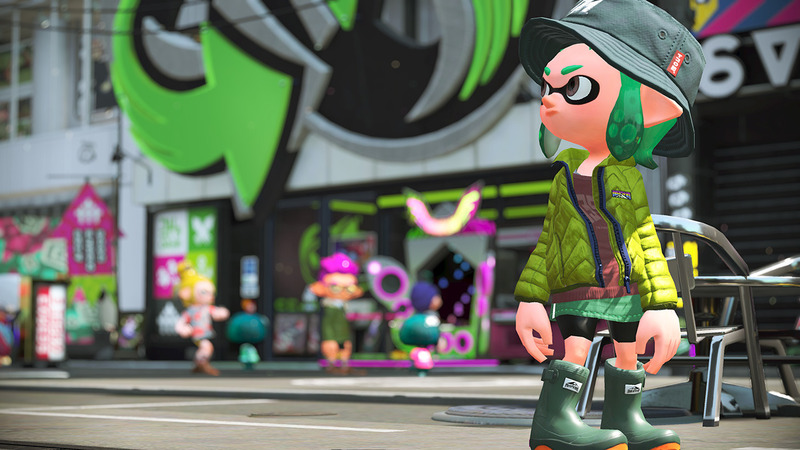 Splatoon 2 supports both local and online multiplayer matches. The game will also support voice chat using the new Nintendo Switch smart device app (a free, limited version of the app will be available this summer), and will add new stages, fashions and weapons after launch, as the original game did. If you just can't get enough Splatoon before the new game launches, you might as well take a test drive with Mario Kart 8 Deluxe. This enhanced port will feature Inklings as playable characters, and Urchin Underpass as a battle arena. Moray Towers is back, this time with inkrails! Oh boi... like all trailers they make every new weapon look super OP... I'll probably just stick to rollers though since I'm terrible with shooters and I can't see myself ever being good with the Splat Dualies or whatever they're called, although rolling around the battlefield looks pretty fun. And guessing from the timeline, assuming this is in the future, Cap'n's probably moved onto the big fishbowl in the sky, but why Marie? And if you look closely, she appears to be wearing Callie's headpiece, but that could just be her hair from that angle. Overall this trailer is cool but I'm still waiting for something completely new, as in new game modes and customization options, since from this trailer, all the characters appear to be wearing gear from the first game or outfits shown in the first reveal. Also those Triforces on Marie's kimono... oh you Nintendo. If I can't get my Classic Straw Boater in the sequel there will be issues. david Squidkid, Mendax and Lucarii like this. I don't think any of the weapons look OP. The specials maybe, but we still don't know how those work. The splat Dualies probably have low range and/or accuracy and/r damage, but high fire rate. Or they might spray ink in a way that leaves a gap in the middle which woukd be annoying. The ink boost dodge thing presumably costs around half a tank of ink, is fairly predictable thanks to its consistent range, and deals no damage, so little danger of that being too OP. The ink slider is like the green shell equivalent to the red shell seeker - no homing but it bounces instead. Since the homing of seekers isn't used especially often in my experience, I'd say that this either costs more ink or deals less damage than a seeker. And like the seeker, it probably doesn't appear very often. So your rollers are still probably the most annoying things in the game. Especially with that new long-distance flick that I think I saw. Among all this talk of new weapons, maps, and hairstyles (tentastyles?) I'm just interested in the fact that the game apparently allows you to wear open-faced jackets. I am easily pleased. So easily pleased, in fact, that I shall make that my avatar. Wait, is there going to BE voice chat or is that wishful thinking? And if you look closely, she appears to be wearing Callie's headpiece, but that could just be her hair from that angle. If you pause at the right time, you'll notice that what may be Callie's headpiece is leaning to the LEFT, but in Splatoon 1, It's tilted to the right. So it's probably not her headpiece. Seriously? I'm just speculating. Jumping down my throat like that was not necessary. Seriously someday I'm gonna be able to post my speculations and people aren't gonna go out of their way to prove me wrong. Someday... I swear the only reason people reply to my posts is to make me look dumb. And Marie could be wearing it the other way, like her hat. I'm so hyped. This looks AMAZING. I think I might be a little too in love with all these exciting aesthetics. I can't wait to play these, honestly. Mario kart 8 deluxe looks great, and I'm a big fan of Mario kart as well as Splatoon. I don't even know which game to be more hyped for! Sorry if I seemed like that, I was just bringing up what may be a hint. According to ThatSRB2DUDE all the Specials from the first game are gone. That means no Kraken, Ink Strike, Bomb Rush etc., so Specials aren't limited to a certain power, except that they probably won't dominate the game or be completely useless. In a similar manner, I believe that the Sub weapons have been changed too - maybe not classics like the Splat Bomb, but less iconic ones like the Seekers, Inkmines and Beakons don't make any appearances in the trailer (although what could be a new Inkmine texture is used for a Special), and the bouncing ink puck seems like a replacement rather than accompaniment for the Seeker. Main Weapons seem to be similar, but some of those may be gone too to make room for the new ones - I'd say that some or all Blasters, Sloshers and maybe Brushes might be lost (ouch because I main Octobrush and second Luna Blaster Deco). If those appear in the trailer, please correct me. Some maps have come in from the original game - Moray Towers is clearly visible, but also changed fairly drastically, so I think it's safe to say that the balance is very different in the new game, thanks to the weapons, hazards and mobility options available (jetpack Special and skinny laser of doom, I'm looking at you), so old maps will probably play very differently. Other maps which I think could make a return are Walleye Warehouse as the Final Destination of Splatoon; Museum D'alphosino but increased in size because that was something that wasn't possible on the Wii U and the devs might have seen it as unfinished business; Port Mackerel as it seems to be a fan favorite, but possibly heavily edited to avoid a power imbalance caused by the jetpack Special - the easiest way I can see to do that is with inkrails; and possibly Saltspray Rig as a nice casual Turf Wars map. Maps that I don't think will return are Bluefin Depot (largely hated for different reasons in Turf Wars and Ranked), Kelp Dome (only two levels, with one level limiting movement speed, so the laser of death would probably be OP), and Camp Triggerfish (nobody's favorite map from what I can tell, and the chargers got a buff which could upset the balance). Again, correct me if I'm wrong. The map appears on pressing X rather than being on the Gamepad screen (I think it's a toggle? Maybe there's an option for that), and SuperJumps work by bringing the map up and pressing a D-pad arrow. The down arrow is for spawn, while the others are for each teammate, which means that 4 players is still the max for a team. There seems to be more variety in the citizens of Inkopolis (if we even still start from there, maybe it's a new location). I saw another Shrimp and a kid Sea Urchin in the trailer, but there's probably more. The shrimp's ice cream shop is possibly a Sub ability changer of some description, as ThatSRB2DUDE pointed out the 3 ice lollies on the chalkboard, but I think they could relate to the 3 pieces of clothing that an Inkling can equip (or is that 4 now, with the pants?). I won't go much into the story mode, but I'm surprised not to see Callie, and a little worried. Team Marie all the way but please don't kill the secondary waifu. The Octolings definitely make a return though, which is nice I guess. Super Mario Odyssey was revealed and is an open-world sandbox, much like 64 and Sunshine, and seems to be on an epic scale. It looks amazing and has been very well-received AFAIK - important because it gives people another reason to buy the Switch, and thus more potential Splatoon players. However, it comes out very late (holiday 2017, which I assume means winter holiday), which limits the number of players at Splatoon 2's summer launch. On the other hand, Legend of Zelda: Breath of the Wild is one of the confirmed launch titles, while Mario Kart 8 Deluxe, Binding of Isaac: Afterbirth+, and Sonic MANIA are all scheduled before Splatoon 2, along with a bunch of other third-party titles - this all means that there should be no shortage of players by Splatoon 2's launch. Afterwards, we have things like Pokemon Stars, Xenoblade 2, Sonic Project 2017 and again Super Mario Odyssey, which should ensure survivability for the rest of 2017. And I didn't mean for this to be so long, so I'll wrap it up. Overall, I think Splatoon 2 has a lot of potential, as does the Switch in general. Just be careful of the status quo changing, and remember that I don't exactly have a degree when it comes to this kind of thing. Hype boiz! With a second game and Inklings in MK8D its looking like Inklings have a chance of being in Smash once again. The squid sisters WILL be back, and the splat bomb rush is back as well I noticed. I'm probably not gonna be allowed to play this game when it comes out.